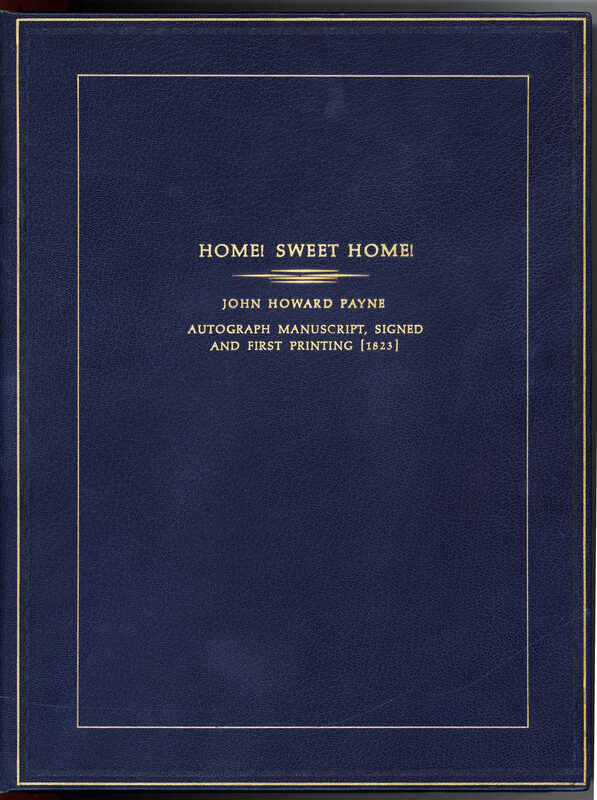 PAYNE, JOHN HOWARD. (1791-1852). American actor, poet and playwright most famous for his song Home! Sweet Home! AMsS. 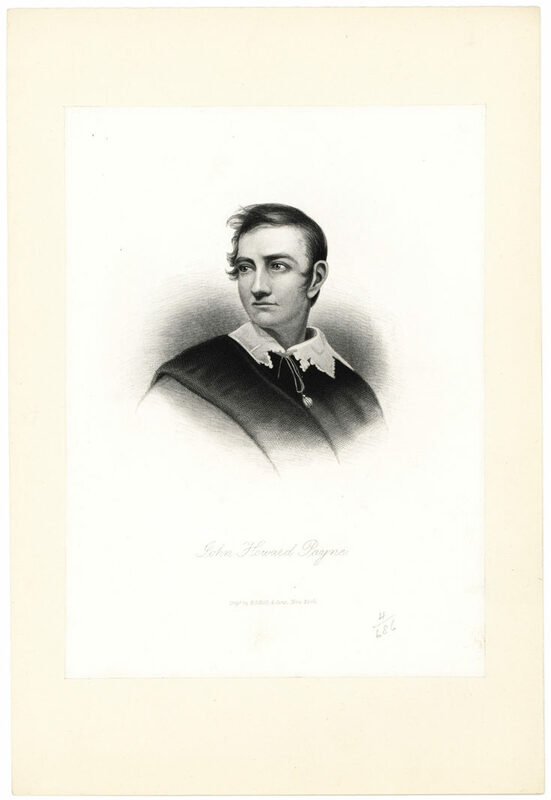 (“John Howard Payne”). 1p. 4to. Washington, August 6, 1850. 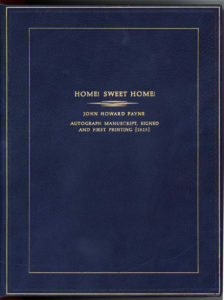 A fair copy of the first two verses of Home! Sweet Home! 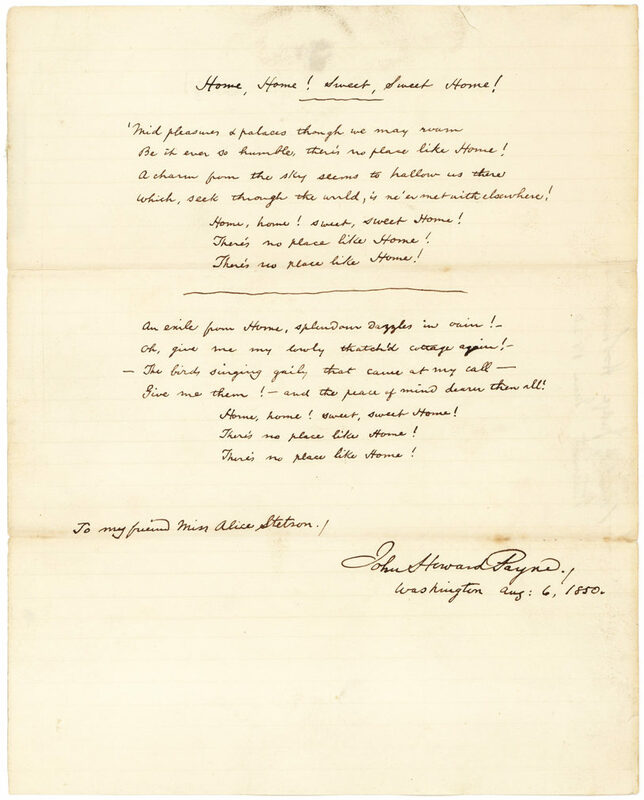 (with slight variations to the printed text) inscribed “to my friend Miss Alice Stetson.” Accompanied by a steel engraving of Payne and an early American printing of the song. “Home, Home! Sweet, Sweet Home! Which, seek through the world, is ne’er met with elsewhere! Oh, give me my lowly thatch’d cottage again! Give me them! –and the peace of mind dearer then [sic] all! 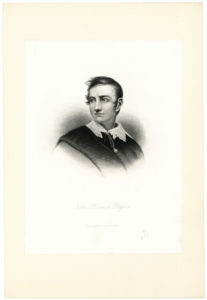 Payne, a born thespian, wrote his first play at age 14 and took to the stage four years later. He performed in theaters in the eastern U.S. before he temporarily took a break from acting to found an athenaeum. Unable to resist the footlights, he found success on the London stage beginning in 1813, and it was at that city’s famous Covent Garden in 1823 that he produced his opera Clari, Maid of Milan, making famous the song Home! Sweet Home! 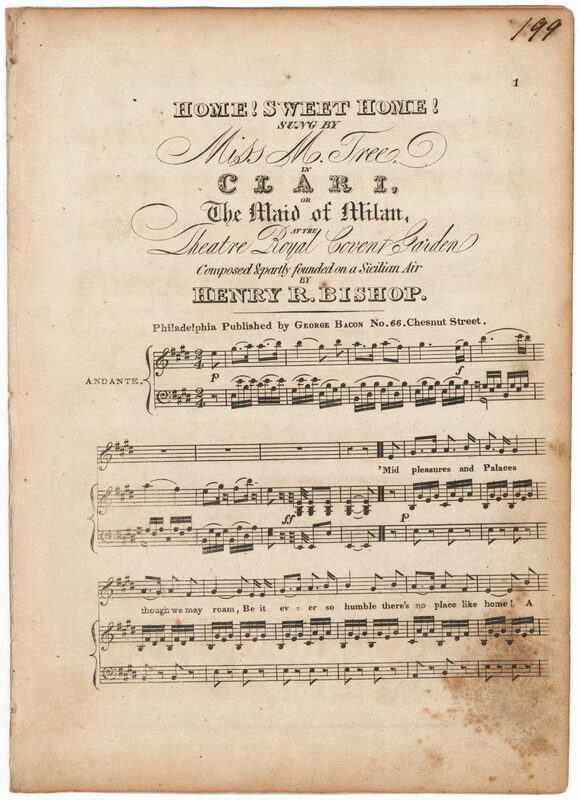 Almost immediately, the piece found its way into other musical compositions including Gaetano Donizetti’s opera Anna Bolena and later, Henry Wood’s Fantasia on British Sea Songs. Decades following its first appearance and ten years after Payne’s death, the song became a favorite of Civil War soldiers on both sides of the conflict. 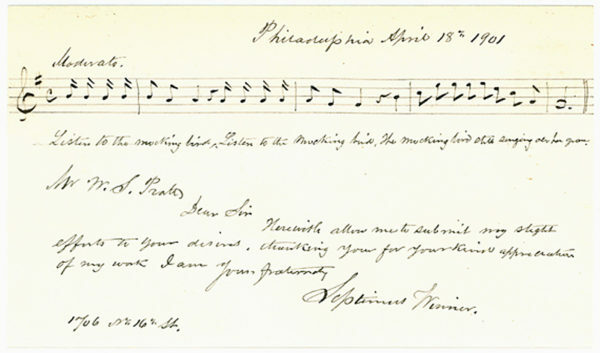 Another admirer of the sentimental song was President Abraham Lincoln for whom Adelina Patti performed it at the White House in 1862. Additionally, the song has appeared in a number of films including The Wizard of Oz, Arsenic and Old Lace, Meet Me in St. Louis, and The House of Cards, a silent film from the Edison Studios, in which the lyrics appeared on title cards while a violinist performed it on-screen. After nearly 20 years abroad, Payne returned home to the United States where he lived among the Cherokee Indians on whose behalf he lobbied Congress and wrote books and newspaper articles in which he asserted that the natives were one of the Ten Lost Tribes of Israel. He died far from home, in Africa, while serving as the American Consul at Tunis. His remains were transferred to Washington’s Oak Hill Cemetery in 1883, nearly thirty years after his death. Written on very slightly stained lined paper which has been folded into thirds; in excellent condition. Contained in a magnificent blue leather presentation binding with gilt lettering that opens for display to reveal the manuscript, a steel engraving of Payne and an early (first?) 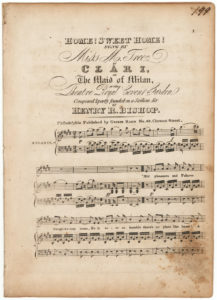 American printing of the sheet music (composed by Henry R. Bishop) “Sung by Miss M. Tree in Clari or The Maid of Milan at the Theatre Royal Covent Garden,” and published by George Bacon of Philadelphia in 1823. The sheet music has been silked and bears some light foxing and age toning. Formerly in the collections of Marjorie Wiggin Prescott (1893-1980; daughter of the banker Albert Wiggin, Chairman of Chase National Bank), New Orleans property tycoon Harry Spiro and then Marshall B. Coyne proprietor of Washington, D.C.’s renowned Madison Hotel.